Leighton House Museum is the former home of Frederic Leighton, eminent Victorian artist, who painted luscious masterpieces such as Flaming June. His house is a jewel, a deep, exotic blue palace, worth visiting just to experience its beauty, but just at the moment they have a stunning collection of art on show. 'A Victorian Obsession' shows a collections of wonderful works, owned by the Mexican collector Juan Antonio Pérez Simón. This is a cross-section of extraordinary Victorian masterpieces, with paintings from Moore, Millais, Waterhouse, Alma Tadema and Leighton all on display. It has to be seen to be believed. Covering eight different spaces, there is such a range of art it would be impossible not to find something to make you swoon. 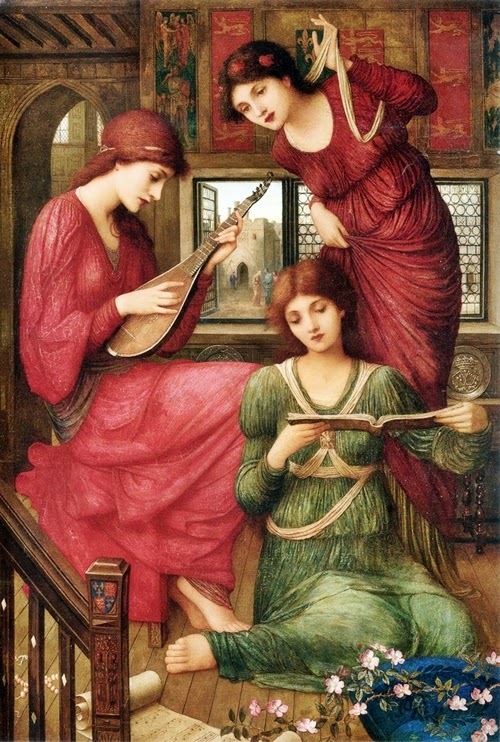 Together with the big names are art works by lesser known artists such as Strudwick, whose glowing richness leaves you entranced. Each of his works has such delicacy in the features of the women and wonderful detail in their surroundings. We loved In the Golden Days, an image from Tennyson, where Guinevere indulges in the innocent pastime of music before it all went wrong. The room guide says the woman standing is the queen, but we were struck by the profile of the woman with the instrument. Her face seemed so particular, so individual. The joy of seeing the works in Leighton's House was that you felt you were seeing them in a natural environment. It's not that I have anything against seeing pictures in museums (Heavens to Betsy! I spend enough time doing just that) but there was an added pleasure of wandering around a beautiful house with these incredible pictures on the wall, as if you were a guest at a party where the host had seductive levels of good taste. I have to say seeing The Crystal Ball made us sigh and swoon a lot. Look at the Princess Leia hair! Goodness, she is too beautiful. Poster girl for the British leg of this exhibition's tour is very appropriately Dorothy Dene, actress, model and possible lover of Leighton. 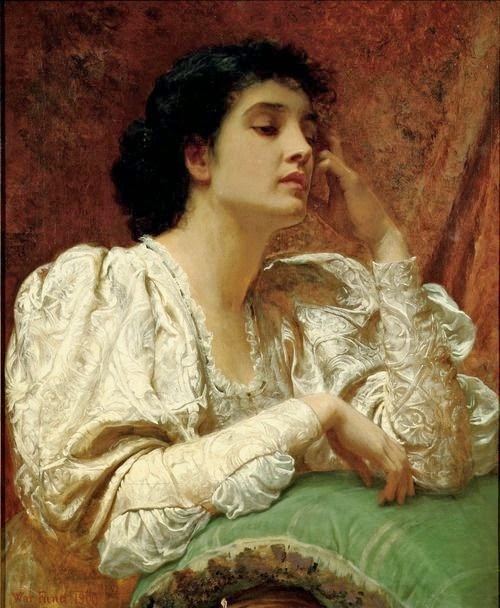 Her face graces many of the Leighton paintings that are featured in the exhibition, instantly recognisable with her head of little curls and her strong features. Crenaia is a nymph, risen from the waters of the River Dargle which ran across the estate of Lord Powerscourt, the painting's first owner. Her half-neglected drapery echoes the white of the water behind her and her skin glows magically. If Leighton did indeed love Miss Dene, you can definitely see why. She is utterly beautiful, I quite fancy her myself. I've been to some rum parties in my time, but this has to top them all. 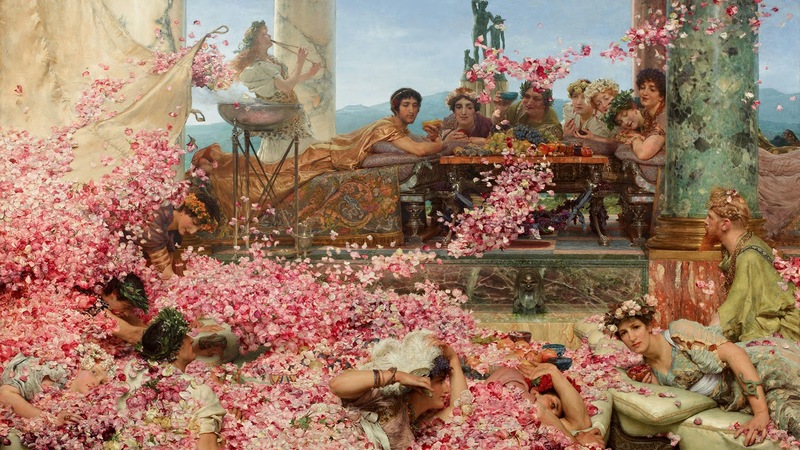 The bonkers young emperor, Heliogabalus, thought it would be a good idea to enliven his party by drowning half the guests under a tsunami of rose petals. I usually just serve iced gems. It is a massive, vivid painting combining extraordinary beauty with cruelty and read from left to right shows you the hurricane of petals falling on the guests. They are covered by this wonderful flurry, some laughing, some vainly trying to protect themselves, but then on the right a woman meets our gaze. She does not look happy. Her companion seems to have noticed the deranged look on the face of their host as he is framed by a tumble of petals. Time to get your coat, Love. It is a very famous picture and very beautiful so it would be easy to brush off the horror of the image. I was astonished by the added extra that greeted you as you entered the room. The smell of roses assaults you as you approach the work. It is at first lovely but it becomes cloying and inescapable as the room is sealed off from the rest of the house. You are in a room with this massive, glowing canvas and you can smell the roses that are killing them. It is as extraordinary as it is disturbing. I now want more smell-o-vision exhibitions. There is a completeness in seeing a collection of exceptional Victorian art in the home of an exceptional Victorian artist. Leighton House, not the biggest venue in the capital, has created an immersive, seductive experience from this touring exhibition. It seems both a natural and perfect setting to see the pictures and the Rose room is an amazing and unusual experience worthy of the entrance fee alone. If you have time and opportunity, see this show, it is wonderful. And it has proven to be the most extraordinary place to write. Sitting in the studio surrounded by pictures of my muse, my main character, whose ghost still wonders there. If one can sense wonder. The exhibition was as tantalizing as you described. But I was happy to find the studio untouched as for me it has become the holiest of the holy places to be. Dorothy was there and the lady on Alma-Tadema's magnificent piece in the next room around the corner of the winter gallery looked just like someone I know. It was as if I had just spoken to her. Went last week,first visit to the house,The Arab Hall is stupendous,and the rest is pretty good! Great collection of paintings as described by Kirsty and on till March so planning to visit again! It was splendid and I agree with David, I may try and go again before March if only to sniff the rose room again. Swoon! Welcome back! Yes, I love the poem too. I did my master's thesis on paintings and Tennyson and his reach is truly astonishing, and I keep finding more every time I look.